Smashingly retro! 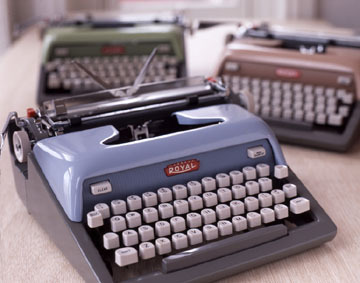 Royal boasted this new Royal Futura as the most modern, complete and efficient portable typewriter in the world when it was first introduced in the late 1950s. In this exciting model, you will enjoy all the important benefits as offered in a large office machine: Royals unique comfortable keyboard slope for relaxed typing; finger-balanced touch; new magic column set that let you set columns at the touch of a button; plus all welded steel constructions! All these, plus many other brilliant features, combine to give you the best typing experience that a portable manual can offer. Beautifully styled in 6 original retro decorator colors (only select colors are in stock).